common ground : Kitchen Baker's Rack...it's back! I know many of you are thinking "Christmas" about now... me too. I'm loving seeing all the Christmas ideas and inspiration out here, and I'm making plans. I go through this every year... I get antsy to decorate for Christmas, but I can't get there quite yet. I really need to celebrate Thanksgiving, first. I really couldn't decorate for Fall at the lease house because we were packing and moving. I put out a few things there, but being in transition, I didn't get the full effect of enjoying Autumn. So the first thing I wanted to do as we moved in to the new house on October 31, was to bring out some of my Fall wool plaid blankets, pillows, and Thanksgiving Turkeys. So I hope you'll bear with me as I share a little November decor. 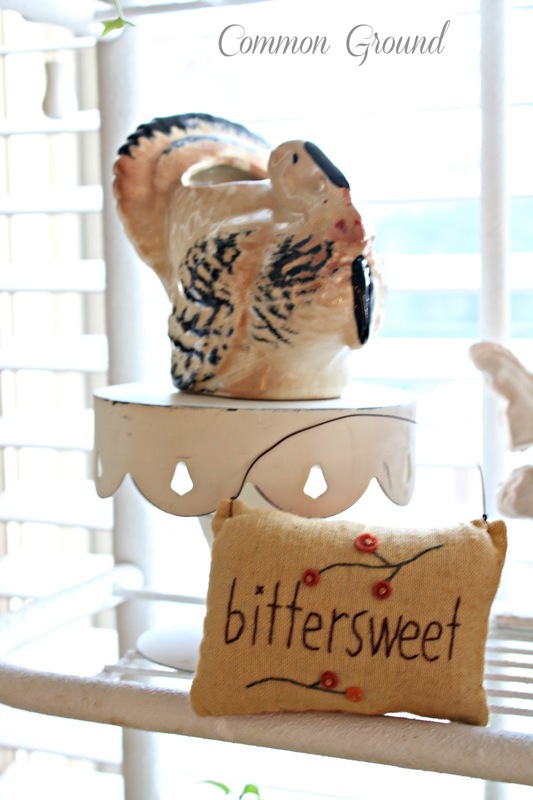 I've mentioned that I've been able to squeeze a few of the pieces I had in the sunporch into the kitchen here, to make up for not having a sunroom or porch. The wicker settee, a wicker chair, and the baker's rack all share the eat-in kitchen space. (just like the lease house) In some ways it's better, because the sunporch had no heat or air, and by this time of year, I couldn't really enjoy it on a daily basis. If we had company or a family gathering I brought in a space heater, but otherwise it was usually too chilly. If the baker's rack looks a little sparse, it's because when these pics were taken, I still hadn't opened all the boxes marked "baker's rack". I got to them today, but I'm planning a little kitchen spot in the lower level, so I'll have some fun displays down there. Here's a peek at how things are coming together in the kitchen dining area. Do you remember that old chippy white door? It looks pretty small here. This room has higher ceilings than the sunporch, so it looks pretty dinky. I haven't hung any prints or items on the walls yet; I've been waiting to unpack all the boxes of prints first. I'm not wanting to make any mistakes with a bunch of holes on those "perfect griege" walls! Our younger daughter Aly has been helping me unpack, and I couldn't have made this move without her. I've always been the person who would and could, work all night or until the job was done. I can't do that anymore, so I want to give her credit for being there when I've really needed her. Here's a pic of both my pretty girlies taken a few years ago. Aly on the left, Erin our St. Louis gal is on the right. Don't know what I'd do without them. They're the best. OK, so I have a few more pics of Fall and Thanksgiving stuff. so hope you all won't get too bored. Believe me, I'm ready to haul in all those tubs of Christmas fun! Your daughters are gorgeous. I love the Thanksgiving decor too. I am ready for Christmas, but Thanksgiving first. I've all but bypassed thanksgiving this year...it's the first time that I have done so and am getting into Christmas. Glad Erin is helping you out and yes your daughters are beautiful. No need to apologize about not decorating for Christmas right now. To me, it's not the Christmas season yet anyway. It's Thanksgiving season! I think you've done a great job spiffing up your bakers rack for the holiday. Your daughters are both so pretty. It's nice that your youngest daughter was available to help you move. Moving can be such a stressful and physically demanding job. Loooove your rack and so happy it is up and so charming in the new home. Always loved how you decorated this rack. Your girls are beautiful and Aly looks just like you. She has your beautiful eyes. Glad she could help you moving is very stressful. Have a great start to the new week ahead. Beautiful daughters just like their mama! Debra your girls are so pretty!! 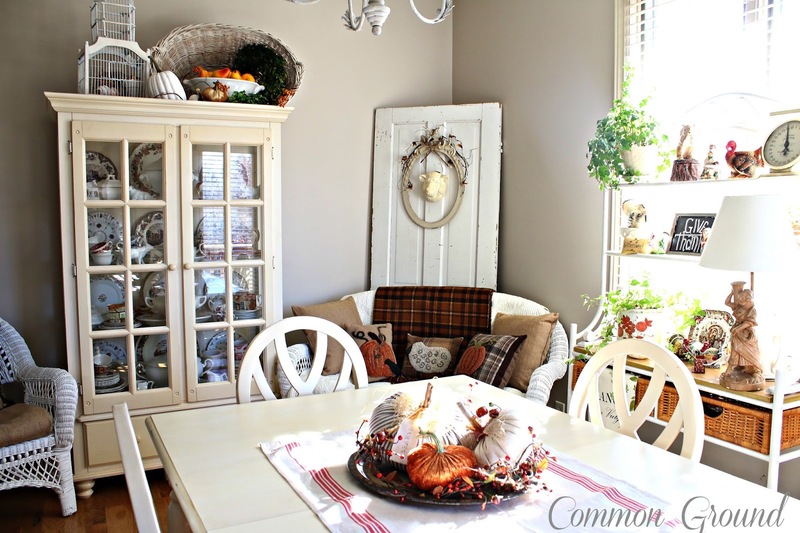 And so is your dining area...love the chippy door with the wicker loveseat in front of it and love the way you accessorized you bakers rack! Beautiful job! I love your dining room!! I'm glad you get to enjoy a few weeks of your Thanksgiving goodies before the Christmas season starts, Debra. How wonderful that you've got your beautiful daughters to give you a helping hand during your move! 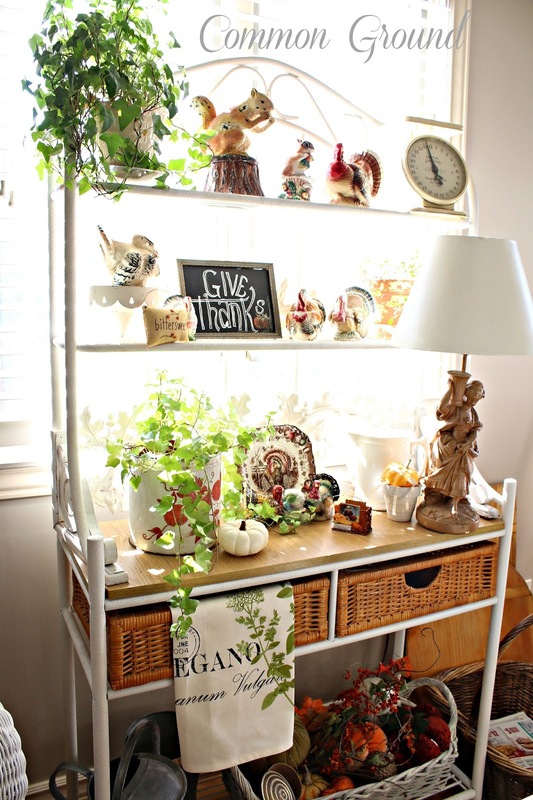 Your baker's rack and wicker add a nice homey touch to your eating area and give you lots of space to display your collections, too. Your home is looking great, Debra! I'm with you, although I may be thinking about how I'm going to decorate for Christmas I can't do it just yet. It is, after all, still November so it is a pleasure to see how you've decorated for Fall and Thanksgiving. I'm not thinking Christmas...not till after Thanksgiving! I don't believe in rushing life! Your bakers rack looks so pretty decorated. I also have not decorated for Thanksgiving yet. So happy your girls are helping...they are so pretty. Your daughters are beautiful. So precious. Your bakers rack is darling. So glad you are getting your "sea legs" Happy Thanksgiving. I am so ready for Christmas too and we are kidless this year so eating out is what's on the menu....it is getting so hard to wait! 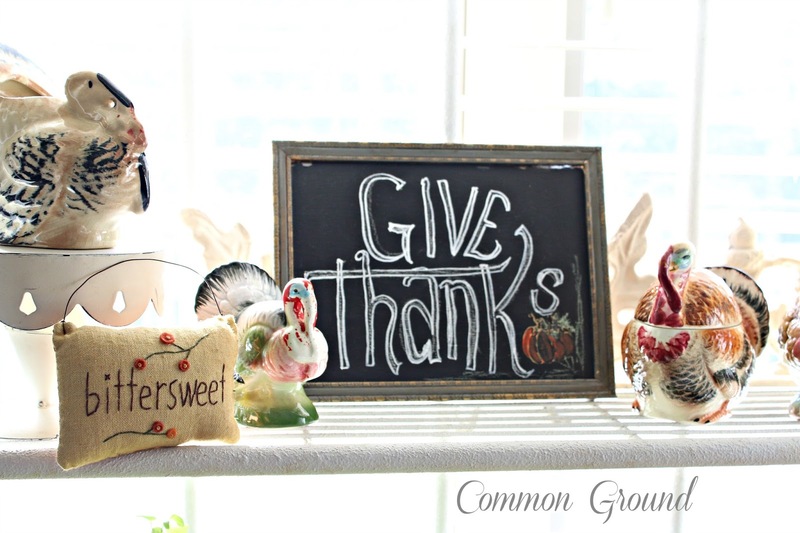 Beautiful thanksgiving touches...love those plates! 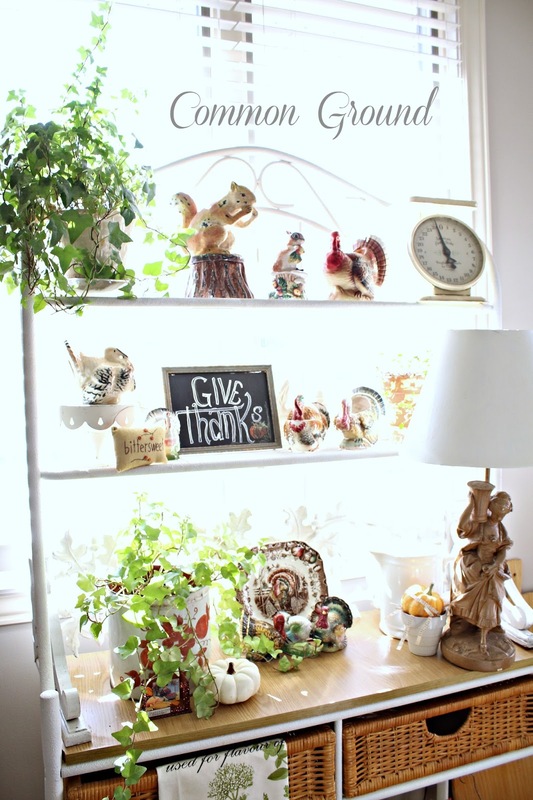 I love seeing your Thanksgiving decor, Debra. Somehow this wonderful holiday gets lost in the shuffle. So happy you're settling in to your new home and able to surround yourself with all of your beauty. I am moving slower these days. Have identified the reason and all is okay. Not quite ready to go all out Christmas quite yet. There are no house tours in reality or cyber space so I am taking my time. And that's a good thing. Loving your breakfast area. Just gorgeous! 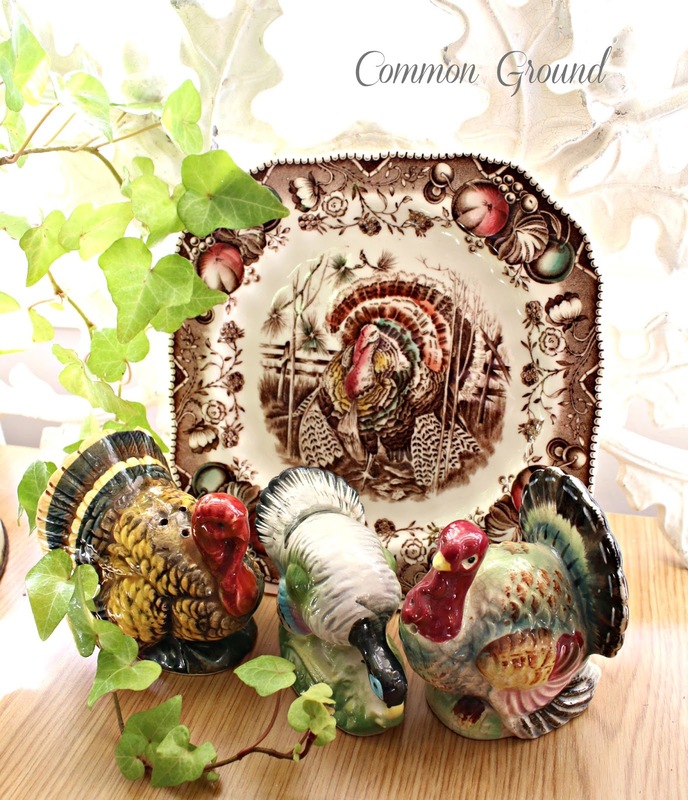 Love, love, love the turkeys! Your dining room is beautiful! And your daughters are beautiful, too! What a wonderful Thanksgiving you will have! "Mrs. Oliver, You have some lovely daughters"!!! I know they have been a tremendous blessing to you, dear friend! Our son, too, has taken a huge load off me while caring for "Mr. Ed" during his recuperation. 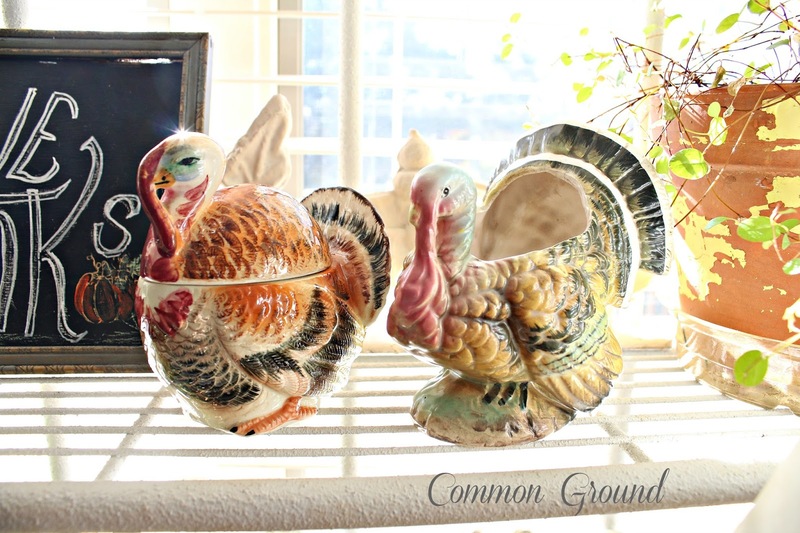 Your Baker's Rack is stunning. . .love the turkeys!!! You, and I, have many blessings to be Thankful for @ Thanksgiving and all year through!